북한에서 탈출한 다양한 계층의 탈북민들의 이야기를 듣습니다. 북한인권운동가 정베드로 대표와 북한 흥남 출신 이한별 소장을 모시고, 함께 이야기를 나누는 시간을 가집니다. 북한의 현실과 인권에 관심 있는 여러분을 초청합니다. Let’s watch the North Korean human rights documentary together and listen to the stories of defectors from various social classes that have escaped from North Korea. We will have time to talk with the director of the JFNK Peter Jung and activist Lee Han Byeol, who defected Hungnam North Korea, about North Korea’s current situation and how we can participate to improve human rights in North Korea. 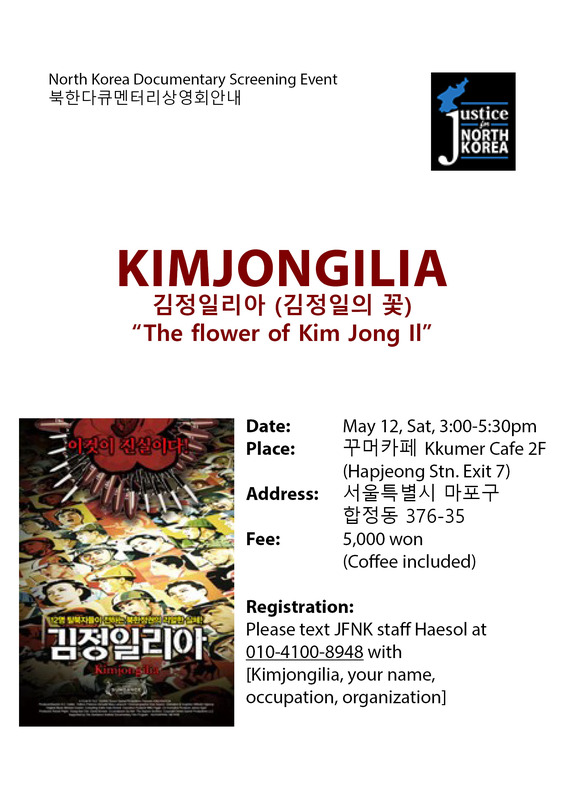 We invite everyone who is interested in the reality of North Korea and human rights! No Comments to "김정일리아 Kimjongilia 상영회 (May 12)"